Martin Friedel in his study with his piano and microscope. Scientist and composer: Martin studied physics and chemistry and worked as a university administrator before taking the plunge into life as a freelance composer. He won an Emmy in 1999 for his score for the TV documentary Dragons of Eden. Science plays an important role in his composing, notably in a unique series of cantatas performed at a number of memorable Melbourne concerts; one concerned with spaceflight was on a rooftop in the city on a beautiful evening. Martin Friedel's String Quartet Nightpieces: Elizabeth Sellars - violin; Briar Goessi - violin; Jennifer Curl - viola; Roseanne Hunt - cello. 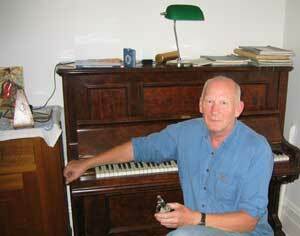 First Performed Astra Concerts, Melbourne 1997; concert recording by Michael Hewes. In my study: notes on things in my study, my project table, the "Out of Africa" debate; see In my study No.1 (1.7 Mb; 3' 46"). See: The Discovery of the Hobbit by Mike Morwood and Penny van Oosterzee (Randon House Australia, 2007).